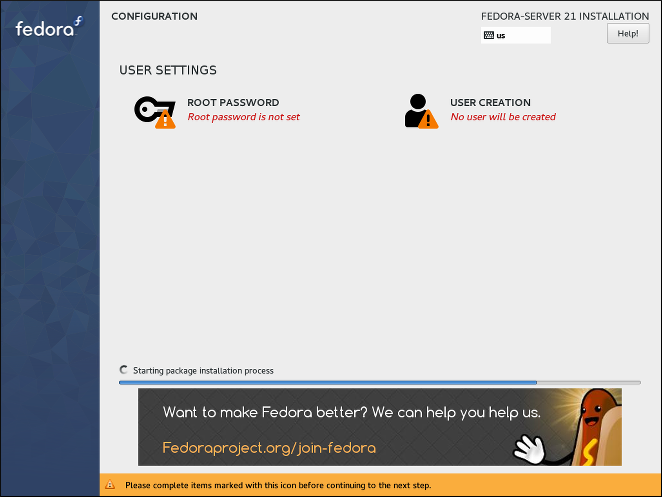 This chapter provides step-by-step instructions for installing Fedora using the Anaconda installer. The bulk of this chapter describes installation using the graphical user interface. A text mode is also available for systems with no graphical display, but this mode is limited in certain aspects (for example, custom partitioning is not possible in text mode). The Fedora installer, Anaconda, is different from most other operating system installation programs due to its parallel nature. Most installers follow a fixed path: you must choose your language first, then you configure network, then installation type, then partitioning, etc. There is usually only one way to proceed at any given time. Some screens will be automatically configured depending on your hardware and the type of media you used to start the installation. You can still change the detected settings in any screen. Screens which have not been automatically configured, and therefore require your attention before you begin the installation, are marked by an exclamation mark. You can not start the actual installation process before you finish configuring these settings. Additional differences appear in certain screens; notably the custom partitioning process is very different from other Linux distributions. These differences are described in each screen’s subsection. The following sections describe how to access logs and an interactive shell during the installation. This is useful when troubleshooting problems, but should not be necessary in most cases. The Fedora installer uses the tmux terminal multiplexer to display and control several windows you can use in addition to the main interface. Each of these windows serves a different purpose - they display several different logs, which can be used to troubleshoot any issues during the installation, and one of the windows provides an interactive shell prompt with root privileges, unless this prompt was specifically disabled using a boot option or a Kickstart command. In general, there is no reason to leave the default graphical installation environment unless you need to diagnose an installation problem. The terminal multiplexer is running in virtual console 1. To switch from the actual installation environment to tmux, press Ctrl+Alt+F1. To go back to the main installation interface which runs in virtual console 6, press Ctrl+Alt+F6. If you choose text mode installation, you will start in virtual console 1 (tmux), and switching to console 6 will open a shell prompt instead of a graphical interface. The console running tmux has 5 available windows; their contents are described in the table below, along with keyboard shortcuts used to access them. Note that the keyboard shortcuts are two-part: first press Ctrl+b, then release both keys, and press the number key for the window you want to use. You can also use Ctrl+b n and Ctrl+b p to switch to the next or previous tmux window, respectively. Main installation program window. Contains text-based prompts (during text mode installation or if you use VNC direct mode), and also some debugging information. Interactive shell prompt with root privileges. Installation log; displays messages stored in /tmp/anaconda.log. Storage log; displays messages related storage devices from kernel and system services, stored in /tmp/storage.log. Program log; displays messages from other system utilities, stored in /tmp/program.log. In addition to displaying diagnostic information in tmux windows, Anaconda also generates several log files, which can be transferred from the installation system. These log files are described in Troubleshooting.adoc#sect-troubleshooting-log-files, and directions for transferring them from the installation system are available in Troubleshooting.adoc#sect-troubleshooting-transferring-logs. You can press Shift+Print Screen at any time during the graphical installation to capture the current screen. These screenshots are saved to /tmp/anaconda-screenshots. Additionally, you can use the autostep --autoscreenshot command in a Kickstart file to capture and save each step of the installation automatically. See ../appendixes/Kickstart_Syntax_Reference.adoc#sect-kickstart-commands-autostep for details. Text mode installation offers an interactive, non-graphical interface for installing Fedora. This may be useful on systems with no graphical capabilities; however, you should always consider the available alternatives before starting a text-based installation. Text mode is limited in the amount of choices you can make during the installation. There are two alternatives to text mode which can both be used even if the installation system does not have a graphical display. You can either connect to the installation system using VNC and perform an interactive graphical installation remotely (see ../advanced/VNC_Installations.adoc#chap-vnc-installations), or you can create a Kickstart file to perform the installation automatically (see ../advanced/Kickstart_Installations.adoc#chap-kickstart-installations). Installation in text mode follows a pattern similar to the graphical installation: There is no single fixed progression; you can configure many settings in any order you want using the main status screen. Screens which have already been configured, either automatically or by you, are marked as [x], and screens which require your attention before the installation can begin are marked with [!]. Available commands are displayed below the list of available options. The installer will always use the English language and the US English keyboard layout. You can configure your language and keyboard settings, but these settings will only apply to the installed system, not to the installation. You can not configure any advanced storage methods (LVM, software RAID, FCoE, zFCP and iSCSI). It is not possible to configure custom partitioning; you must use one of the automatic partitioning settings. You also cannot configure where the boot loader will be installed. To start a text mode installation, boot the installation with the inst.text boot option used either at the boot command line in the boot menu, or in your PXE server configuration. See Booting_the_Installation.adoc#chap-booting-the-installation for information about booting and using boot options. The graphical installation interface is the preferred method of manually installing Fedora. It allows you full control over all available settings, including custom partitioning and advanced storage configuration, and it is also localized to many languages other than English, allowing you to perform the entire installation in a different language. The graphical mode is used by default when you boot the system from local media (a CD, DVD or a USB flash drive). The sections below discuss each screen available in the installation process. Note that due to the installer’s parallel nature, most of the screens do not have to be completed in the order in which they are described here. Each screen in the graphical interface contains a Help button. This button opens the Yelp help browser displaying the section of the Fedora Installation Guide relevant to the current screen. You can also control the graphical installer with your keyboard. Use Tab and Shift+Tab to cycle through active control elements (buttons, check boxes, etc.) on the current screen, Up and Down arrow keys to scroll through lists, and Left and Right to scroll through horizontal toolbars or table entries. Space or Enter can be used to select or remove a highlighted item from selection and to expand and collapse drop-down menus. Your current keyboard layout is displayed in the top right hand corner. Only one layout is configured by default; if you configure more than layout in the Keyboard Layout screen (Installing_Using_Anaconda.adoc#sect-installation-gui-keyboard-layout), you can switch between them by clicking the layout indicator. The first screen displayed immediately after the graphical installer starts is the Welcome screen. First, select your preferred language in the left hand side column, and then select your locale from the right hand side column. You can use the text input field in the bottom left corner to search for your language instead of looking for it in the full list of more than 70 languages. The language you select on this screen will be used during the installation, and it will also be used on the installed system by default. You can change the language for the installed system later, but once you click Continue on this screen, you will not be able to go back and change the language used inside the installer itself. One language is pre-selected by default on top of the list. If network access is configured at this point (for example, if you booted from a network server instead of local media), the pre-selected language will be determined based on automatic location detection using the GeoIP module. Alternatively, if you used the inst.lang= option on the boot command line or in your PXE server configuration, this language will be selected by default, but you will still be able to change it. After you select your language and locale, click Continue to confirm your selection and proceed to Installing_Using_Anaconda.adoc#sect-installation-gui-installation-summary. If you are installing a pre-release version of Fedora, a message will be shown after you click Continue warning you about the pre-release status of your installation media. Click I accept my fate to continue with the installation, or Get me out of here to quit the installation and reboot your system. The Installation Summary screen is the central location for setting up an installation. Most of the options which can be configured during the installation can be accessed from here. If you used a Kickstart option or a boot option to specify an installation repository on a network, but no network is available at the start of the installation, the installer will display the Network Configuration screen for you to set up a network connection prior to displaying the Installation Summary screen. A warning symbol (yellow triangle with an exclamation mark) next to an icon means that a screen requires your attention before you start the installation. This typically happens with the Installation Destination screen, because even though there is a default automatic partitioning variant, you always have to at least confirm this selection, even if you do not want to make any changes. If a link is greyed out, it means that the installer is currently configuring this section, and you must wait for the configuration to finish before accessing that screen. This typically happens when you change the installation source in the Installation Source screen and the installer is probing the new source location and gathering a list of available packages. Screens with black text and no warning symbol mean that this screen does not require your attention. You can still change your settings in these screens, but it is not necessary to do so to complete the installation. This typically happens with localization settings, as these are either detected automatically, or set up on the previous screen where you select your language and locale. A warning message is displayed at the bottom of the summary screen, and the Begin Installation button is greyed out, as long as at least one item has not been configured yet. Each screen also has an explanatory text below its title, showing settings currently configured in that screen. This text may be concatenated; in that case, move your mouse cursor over it and wait until a tooltip with the full text appears. Once you configure everything required for the installation, you can press the Begin Installation button to start installing Fedora. This will take you to Installing_Using_Anaconda.adoc#sect-installation-gui-installation-progress. Note that as the text below this button says, nothing will be written to your hard drive before you press this button. You can press Quit at any point; this will discard all changes you made in the installer so far and reboot the system. The Date & Time screen allows you to configure time and date-related settings for your system. This screen is automatically configured based on the settings you selected in Installing_Using_Anaconda.adoc#sect-installation-gui-welcome, but you can change your date, time and location settings before you begin the installation. First, select your Region using the drop-down menu in the top left corner of the screen. Then, select your City, or the city closest to your location in the same time zone. 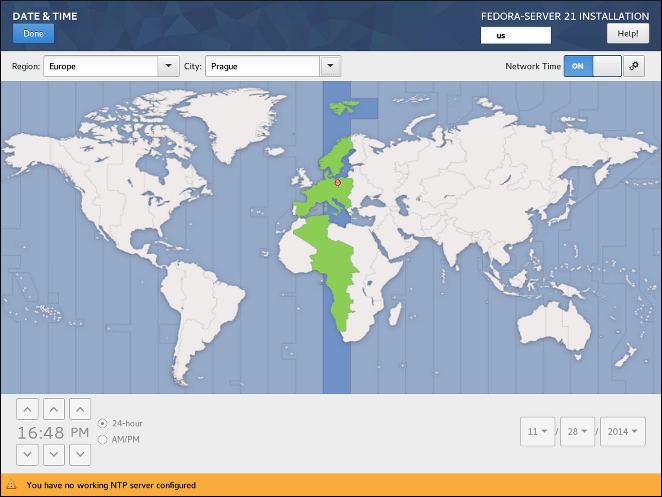 Selecting a specific location helps Fedora ensure that your time is always set correctly including automatic time changes for daylight savings time if applicable. You can also select a time zone relative to Greenwich Mean Time (GMT) without setting your location to a specific region. To do so, select Etc as your region. The list of cities and regions comes from the Time Zone Database (tzdata) public domain, which is maintained by the Internet Assigned Numbers Authority (IANA). The Fedora Project can not add cities or regions into this database. You can find more information at the IANA official website. The switch labeled Network Time in the top right corner of the screen can be used to enable or disable network time synchronization using the Network Time Protocol (NTP). Enabling this option will keep your system time correct as long as the system can access the internet. 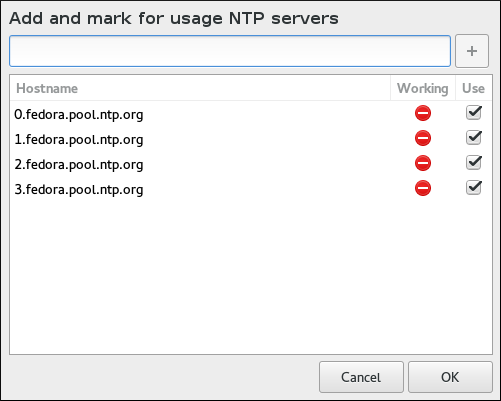 By default, four NTP pools are configured; you can add others and disable or remove the default ones by clicking the gear wheel button next to the switch. If you disable network time synchronization, the controls at the bottom of the screen will become active, and you will be able to set the current time and date manually. After configuring your time and date settings, press the Done button in the top left corner to return to Installing_Using_Anaconda.adoc#sect-installation-gui-installation-summary. The Keyboard Layout screen allows you to set up one or more keyboard layouts for your system and a way to switch between them. One keyboard layout is configured automatically based on your selection in Installing_Using_Anaconda.adoc#sect-installation-gui-welcome, but you can change this layout and add additional ones before you begin the installation. Keyboard layouts are a separate setting from system languages, and these two settings can be mixed as you see fit. All settings configured in this screen will be available on the installed system, and they will also become immediately available inside the installer. You can use the keyboard icon in the top right corner of any screen, or the keyboard switch you configured in this screen, to cycle between your configured layouts. The left half of the screen contains a window listing all currently configured layouts. The order in which the layouts are displayed is important - the same order will be used when switching between layouts, and the first listed layout will be the default on your system. The text field on the right side of the screen can be used to test the currently selected layout. The + button adds a new layout. When you press this button, a new window opens with a list of all available layouts, grouped by language. You can find a layout by browsing the list, or you can use the search bar at the bottom of this window. When you find the layout you want to add, highlight it and press Add. The - button removes the currently highlighted layout. The up and down buttons can be used to move the highlighted layout up or down in the list. The keyboard button opens a new window which offers a visual representation of the highlighted layout. If you use a layout that cannot accept Latin characters, such as Russian, you are advised to also add the English (United States) layout and configure a keyboard combination to switch between the two layouts. If you only select a layout without Latin characters, you may be unable to enter a valid root password and user credentials later in the installation process. This may prevent you from completing the installation. You can also optionally configure a keyboard switch which can be used to cycle between available layouts. To do so, click the Options button on the right side of the screen. The Layout Switching Options dialog will open, allowing you to configure one or more keys or key combinations for switching. Select one or more key combinations using the check boxes next to them, and click OK to confirm your selection. After you finish configuring keyboard layouts and switches, click Done in the top left corner to return to Installing_Using_Anaconda.adoc#sect-installation-gui-installation-summary. 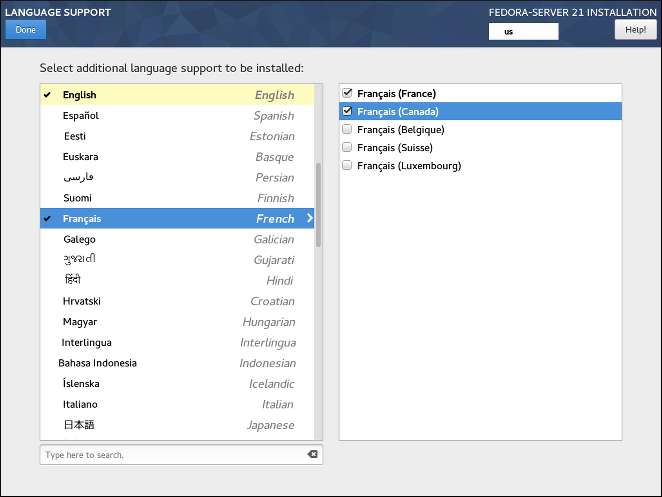 The Language Support screen allows you to configure language settings for your system. The default language is determined by your selection in Installing_Using_Anaconda.adoc#sect-installation-gui-welcome and support for this language can not be removed. You can only add additional languages, which will be available on the installed system - not during the installation. If you want to change the default language, or the language used during the installation, you must reboot your system, start the installer again, and select a different language in Installing_Using_Anaconda.adoc#sect-installation-gui-welcome. Adding support for another language does not automatically configure the corresponding keyboard layout. 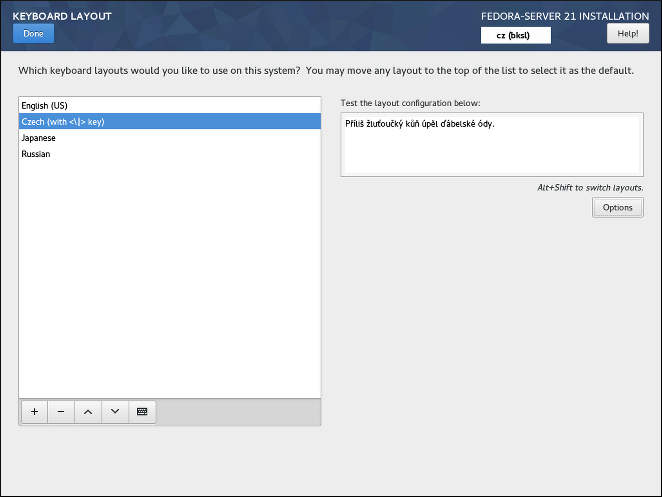 Layouts are a separate setting configured in Installing_Using_Anaconda.adoc#sect-installation-gui-keyboard-layout. The left panel contains a list of available language groups such as English or Bulgarian. If at least one language from a group is selected, a check mark will be displayed next to the group, and the list entry will be highlighted. This allows you to easily see which languages you have configured support for. To add support for one or more additional languages, click a group in the left panel, and then select one or more regional variations in the right panel using check boxes next to list entries. Repeat this process for all languages you want to install support for. Enabling support for some languages (typically languages which use non-Latin script) will install additional packages - for example, enabling support for one or more languages from the Arabic group will also install the arabic-support package group. For more information about packages, see Installing_Using_Anaconda.adoc#sect-installation-gui-software-selection. Once you have made your selections, click Done in the top left corner to return to Installing_Using_Anaconda.adoc#sect-installation-gui-installation-summary. The Installation Source screen allows you to specify a location (local or on the network) from which packages will be downloaded and installed on your system. This screen will be configured automatically in most cases, but you can change your settings or add additional sources. Normally, when you first enter the Installation Summary screen, the installer will attempt to configure an installation source based on the type of media you used to boot. The full Fedora Server DVD will configure the source as local media, the netinst ISO image will configure the closest network mirror, etc. This process takes some time, especially if the default source is a network mirror. If you plan to use a custom installation source, use the inst.askmethod boot option to skip the initial configuration; this will allow you to enter this screen immediately. See ../advanced/Boot_Options.adoc#sect-boot-options-sources for information about boot options. The following options are available. Note that not all of them may be displayed. This is the option selected by default if you started the installer from media containing an installation source, such as a live DVD. No additional configuration is necessary. You can click the Verify button check the media integrity. This option will appear if the installation program detected a partitioned hard drive with mountable file systems during boot. Select this option, click the Choose an ISO button, and browse to the installation ISO file’s location on your system. You can click the Verify button to check the file’s integrity. Use this option to download packages to be installed from a network location instead of local media. This is the default selection on network installation media. In most cases, the Closest mirror option available from the protocol selection drop-down menu is preferable. If this option is selected, packages for your system will be downloaded from the most suitable location (mirror). To manually configure a network-based installation source, use the drop-down menu to specify the protocol to be used when downloading packages. This setting depends on the server you want to use. Then, type the server address (without the protocol) into the address field. If you choose NFS, a second input field will appear where you can specify custom NFS mount options. To configure a proxy for an HTTP or HTTPS source, click the Proxy setup button. Check Enable HTTP proxy and type the URL into the Proxy URL box. If the proxy server requires authentication, check Use Authentication and enter your user name and password. Click OK to finish the configuration. If your HTTP or HTTPS URL refers to a repository mirror list, mark the check box under the address field. You can also specify additional repositories in the Additional repositories section to gain access to more installation environments and software add-ons. All environments and add-ons will be available for selection in Installing_Using_Anaconda.adoc#sect-installation-gui-software-selection once you finish configuring the sources. To add a repository, click the + button. To delete a repository, select one in the list and click the - button. Click the arrow icon to revert to the previous list of repositories, i.e. to replace current entries with those that were present at the time you entered the Installation Source screen. To activate or deactivate a repository, click the check box in the Enabled column at each entry in the list. You can name your additional repository and configure it the same way as the primary repository on the network using the input fields on the right side of the section. Once you have selected your installation source, click Done in the top left corner to return to Installing_Using_Anaconda.adoc#sect-installation-gui-installation-summary. The Software Selection screen allows you to choose a Base Environment and Add-ons. These options control which software packages will be installed on your system during the installation process. This screen is only available if Installing_Using_Anaconda.adoc#sect-installation-gui-installation-source is properly configured and only after the installer has downloaded package metadata from the source. It is not possible to select specific packages during a manual installation. You can only select pre-defined environments and add-ons. If you need to control exactly which packages are installed, you must use a Kickstart file and define the packages in the %packages section. See ../advanced/Kickstart_Installations.adoc#chap-kickstart-installations for information about Kickstart installations. The availability of environments and add-ons depends on your installation source. 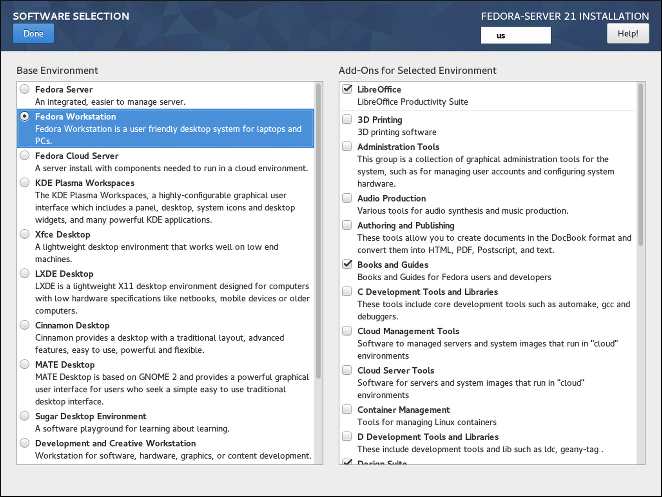 By default, the selection depends on the installation media you used to start the installation; Fedora Server installation image will have different environments and add-ons available for selection than, for example, the Fedora Cloud image. You can change this by configuring a different installation source containing different environments. To configure your software selection, first choose an environment on the left side of the screen. Only one environment can be chosen, even if more are available. Then, on the right side of the screen, select one or more add-ons which you want to install by marking the check boxes next to each add-on. The list of add-ons is divided into two parts by a horizontal line. Add-ons above this line are defined as part of your chosen environment; if you select a different environment, the add-ons available here will change. The add-ons displayed below the separator are not specific to your chosen environment. Environments and add-ons are defined using a comps.xml file in your installation source (for example, in the repodata/ directory on the full Fedora Server installation DVD). Review this file to see exactly which packages will be installed as part of a certain environment or add-on. For more information about the comps.xml file, see ../appendixes/Kickstart_Syntax_Reference.adoc#sect-kickstart-packages. After you finish configuring your software selection, click Done in the top left corner to return to Installing_Using_Anaconda.adoc#sect-installation-gui-installation-summary. 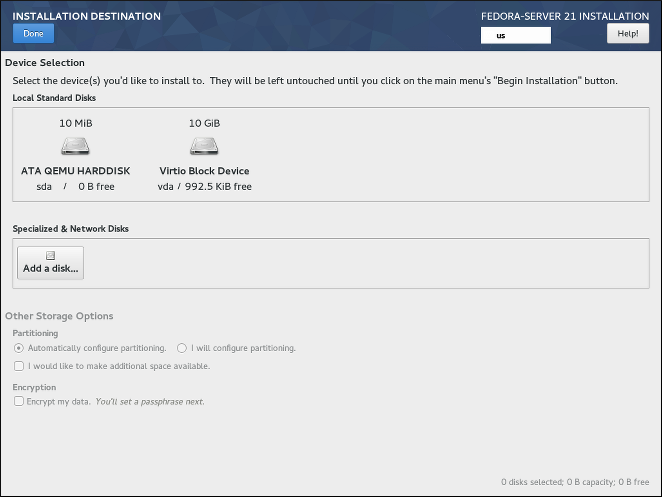 The Installation Destination screen allows you to configure storage options - namely, which disks will be used as the installation target for your Fedora installation. At least one disk must always be selected for the installation to proceed. For information about the theory and concepts behind disk partitioning in Linux, see Installing_Using_Anaconda.adoc#sect-installation-gui-manual-partitioning-recommended. If you plan to use a disk which already contains some data - for example, if you want to shrink an existing Microsoft Windows partition and install Fedora as a second system or if you are upgrading a previous release of Fedora, make sure to back up any important data first. Manipulating partitions always carries a risk - if the process is interrupted or fails for any reason (installer error, hardware failure, power outage, etc. ), any data already on the disk may become impossible to recover. In the top part of the screen, all locally available storage devices (SATA, IDE and SCSI hard drives, USB flash drives, etc.) are displayed in the Local Standard Disks section. Local disks are detected when the installer starts - any storage devices connected after the installation has started will not be shown. If you need to configure additional local storage devices, select I will configure partitioning and press Done to move to Installing_Using_Anaconda.adoc#sect-installation-gui-manual-partitioning. Then, connect any new hard drives you want to make available during the installation, and press the button marked by a circular arrow in the set of controls below the list of mount points on the left side of the screen. In the dialog window that opens, press Rescan Disks and wait until the scanning process completes. Then, press OK to return to Installing_Using_Anaconda.adoc#sect-installation-gui-storage-partitioning; all detected disks including any new ones will be displayed in the Local Standard Disks section. The Specialized & Network Disks section below shows advanced network storage (such as iSCSI and FCoE disks) currently configured. When you first open this screen, no such devices will be displayed because they can not be automatically detected; to search for network storage devices Add a disk button and proceed with Installing_Using_Anaconda.adoc#sect-installation-gui-installation-destination. Any network storage you configure will then show up in the Specialized & Network Disks the same way local disks are shown above. All storage devices which will be used to install Fedora have a black circle icon with a white check mark on them. Disks not marked by this icon will not be used during the installation - they will be ignored if you choose automatic partitioning, and they will not be available in manual partitioning. USB storage devices such as flash drives and external disks will be shown in the Local Standard Disks as well, and they will be available for selection the same way internal hard drives are. Make sure to not select any removable storage as installation targets unless you really want to do so. If you accidentally use a removable drive to install Fedora and then unplug it, your system will likely become unusable. Automatically configure partitioning - If this option is selected, then after you press Done in the top left corner of the screen, the installer will determine the total amount of space on all selected disks, and it will create a Logical Volume Management (LVM) layout suitable for your system. The specifics of this layout depend on whether your system uses BIOS or UEFI firmware, the total amount of free space on your disks, and the amount of RAM on your system (which determines the size of your swap space). With automatic partitioning, you can also select the I would like to make additional space available option below. Use this option if you want to reclaim space from an existing partitioning layout - for example, if a disk you want to use already contains a different operating system, and you want to make this system’s partitions smaller to allow more room for Fedora. The Reclaim space dialog which opens if this option is selected is described later in this section. I will configure partitioning - Select this option and press Done in the top left corner of the screen to configure your system’s partitioning layout manually. This requires some knowledge of the theory behind disk partitions and related concepts, but gives you full control over the way the system will be installed. For instructions for manual partitioning, see Installing_Using_Anaconda.adoc#sect-installation-gui-manual-partitioning. Additionally, you can select Encrypt my data; this will encrypt all partitions except the ones needed to boot the system (such as /boot) using Linux Unified Key Setup (LUKS). Encrypting your hard drive is recommended. For detailed information about LUKS encryption, see the Fedora Security Guide, available at http://docs.fedoraproject.org/. If you lose the LUKS passphrase, any encrypted partitions and the data on them will become completely inaccessible. There is no way to recover a lost passphrase. However, if you perform a Kickstart installation, you can save encryption passphrases and create backup encryption passphrases during the installation. See ../advanced/Kickstart_Installations.adoc#chap-kickstart-installations for information about Kickstart installations. 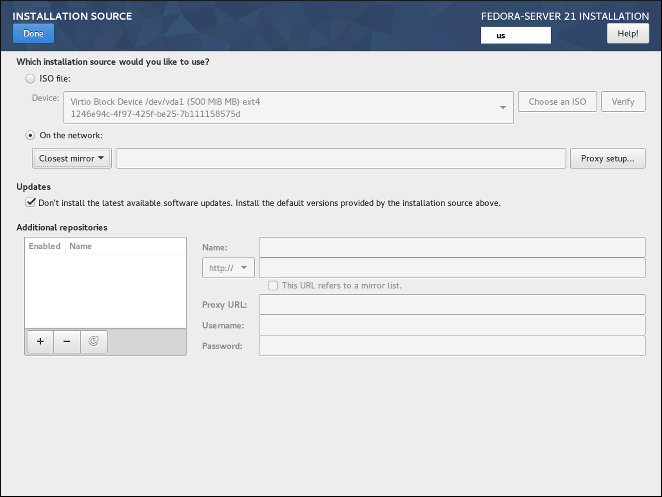 To control which one of your selected storage devices will contain the boot loader, click the Full disk summary and bootloader link in the bottom left corner of the screen, and follow the instructions in Installing_Using_Anaconda.adoc#sect-installation-gui-storage-partitioning-bootloader. Note that while in most cases it is sufficient to leave the boot loader in the default location, some configurations (for example, systems which require chain loading from another boot loader) will require the boot drive to be specified manually. If you chose to encrypt your hard drive, the Disk Encryption Passphrase dialog will appear. Enter your chosen passphrase into the Passphrase and Confirm fields. When you do so, the passphrase will be automatically evaluated and its strength will be displayed, along with suggestions on how to make it stronger if the installer has determined it to be weak. For information about creating strong passwords, see Fedora Security Guide. If you selected automatic partitioning and the I would like to make additional space available, or if there is not enough free space on your selected hard drives to install Fedora, the Reclaim Space dialog will appear. This dialog lists all disk devices you have configured and all partitions on those devices. The bottom right corner of the dialog displays information about how much space the system needs for at least a minimal installation and how much space you have reclaimed. If you use the Reclaim Space dialog to delete a partition, all data on that partition will be lost. If you want to preserve your data, use the Shrink option, not the Delete option. First, review the displayed list of available storage devices. The Reclaimable Space column shows how much space can be reclaimed from each entry. To reclaim space, select a disk or partition, and press either the Delete button to delete that partition (or all partitions on a selected disk), or Shrink to use free space on a partition while preserving existing data. Alternatively, you can press Delete all in the bottom right corner; this will delete all existing partitions on all disks and make this space available to Fedora, but all existing data on all disks will be lost. After you free enough space for your Fedora installation, press Reclaim space to finish. No changes to any disks will be made until you press Begin Installation in Installing_Using_Anaconda.adoc#sect-installation-gui-installation-summary. The Reclaim Space dialog only marks partitions for resizing or deletion, but no such action is performed immediately. If you selected the I will configure partitioning option, pressing Done will open the Manual Partitioning screen. See Installing_Using_Anaconda.adoc#sect-installation-gui-manual-partitioning for further instructions. Fedora uses GRUB2 (GRand Unified Bootloader version 2) as its boot loader. The boot loader is the first program that runs when the computer starts and is responsible for loading and transferring control to an operating system. GRUB2 can boot any compatible operating system (including Microsoft Windows) and can also use chain loading to transfer control to other boot loaders for unsupported operating systems. Installing GRUB2 may overwrite your existing boot loader. If you are installing Fedora system with more than one disk, you may want to manually specify where the bootloader should be installed. Click the Full disk summary and bootloader link at the bottom of the Installation Destination screen. The Selected Disks dialog will appear. The bootloader will be installed on the device of your choice, or on a UEFI system, the EFI system partition will be created on that device during guided partitioning. In the Boot column, a "tick" icon marks one of the devices as the intended boot device. To change the boot device, select a device from the list and click the Set as Boot Device button to install the boot loader there instead. Only one device can be set as the boot device. To decline installation of a new boot loader, select the device currently marked for boot and click the Do not install bootloader button. This will remove the tick and ensure GRUB2 is not installed on any device. If you choose not to install a boot loader for any reason, you will not be able to boot the system directly, and you must use another boot method, such as a stand-alone commercial boot loader application. Use this option only if you are sure you have another way to boot your system. The boot loader may also require a special partition to be created, depending on whether your system uses BIOS or UEFI firmware and also depending on whether the boot drive has a GUID Partition Table (GPT) or a Master Boot Record (MBR, also known as msdos) label. If you use automatic partitioning, the installer will create this partition if needed. For details, see Installing_Using_Anaconda.adoc#sect-installation-gui-manual-partitioning-recommended. This part of the Installation Destination screen allows you to configure non-local storage devices, namely iSCSI and FCoE storage. This section will mostly be useful to advanced users who have a need for networked disks. For instructions on setting up local hard drives, see Installing_Using_Anaconda.adoc#sect-installation-gui-storage-partitioning. This section only explains how to make existing network disks available inside the installer. It does not explain how to set up your network or a storage server, only how to connect to them. The screen contains a list of all currently available (discovered) network storage devices. When the screen is opened for the first time, the list will be empty in most cases because no network storage has been discovered - the installer makes no attempt at discovering this unless you configure network disks using a Kickstart file. 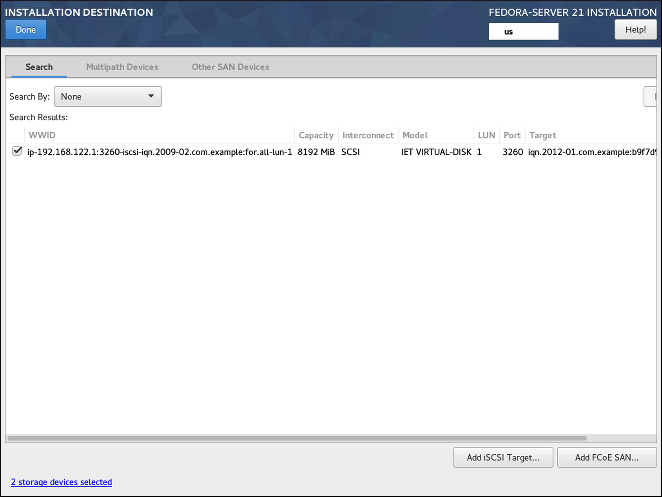 To add one or more storage devices to the screen so you can search them and use them in the installation, click Add iSCSI Target or Add FCoE SAN in the bottom right corner of the screen, and follow the instructions in Installing_Using_Anaconda.adoc#sect-installation-gui-installation-destination-add-iscsi or Installing_Using_Anaconda.adoc#sect-installation-gui-installation-destination-add-fcoe, depending on which type of network storage you want to add. Network storage devices successfully discovered and configured by the installer will then be displayed in the main list, along with identifying information such as Name, WWID, Model and Target. To sort the list by a specific column (for example WWID), click the column’s heading. On lower display resolutions, the list may be too wide to fit on the screen, and some of the columns or buttons may be hidden initially. Use the horizontal scroll bar at the bottom of the list to move your view and see all available table columns and controls. Displays all available devices, regardless of their type, and allows you to filter them either by their World Wide Identifier (WWID) or by the port, target, or logical unit number (LUN) at which they are accessed. Storage devices accessible through more than one path, such as through multiple SCSI controllers or Fiber Channel ports on the same system. The installation program only detects multipath storage devices with serial numbers that are 16 or 32 characters long. Devices available on a Storage Area Network (SAN). Depending on the tab you are currently in, you can filter the discovered devices by using the Filter By field. Some of the filtering options are automatically populated based on discovered devices (for example, if you select Filter By: Vendor, another drop-down menu will appear showing all vendors of all discovered devices). Other filters require your input (for example when filtering by WWID), and present you with a text input field instead of a drop-down menu. In the list (regardless of how it is filtered), each device is presented on a separate row, with a check box to its left. Mark the check box to make the device available during the installation process; this will cause this device (node) to be shown in the Specialized & Network Disks section in Installing_Using_Anaconda.adoc#sect-installation-gui-storage-partitioning. There, you can select the disk as an installation target and proceed with either manual or automatic partitioning. Devices that you select here are not automatically wiped by the installation process. Selecting a device on this screen does not, in itself, place data stored on the device at risk. Also note that any devices that you do not select here to form part of the installed system can be added to the system after installation by modifying the /etc/fstab file. When you have selected the storage devices to make available during installation, click Done to return to Installing_Using_Anaconda.adoc#sect-installation-gui-storage-partitioning. To use iSCSI storage devices, the installer must be able to discover them as iSCSI targets and be able to create an iSCSI session to access them. Both of these steps may require a user name and password for Challenge Handshake Authentication Protocol (CHAP) authentication. You can also configure an iSCSI target to authenticate the iSCSI initiator on the system to which the target is attached (reverse CHAP), both for discovery and for the session. Used together, CHAP and reverse CHAP are called mutual CHAP or two-way CHAP. Mutual CHAP provides the greatest level of security for iSCSI connections, particularly if the user name and password are different for CHAP authentication and reverse CHAP authentication. Follow the procedure below to add an iSCSI storage target to your system. Click the Add iSCSI Target button in the bottom right corner of the Installing_Using_Anaconda.adoc#sect-installation-gui-installation-destination screen. A new dialog window titled Add iSCSI Storage Target will open. Enter the IP address of the iSCSI target in the Target IP Address field. The string iqn. (including the period). A date code specifying the year and month in which your organization’s Internet domain or subdomain name was registered, represented as four digits for the year, a dash, and two digits for the month, followed by a period. For example, represent September 2010 as 2010-09. Your organization’s Internet domain or subdomain name, presented in reverse order (with the top-level domain first). For example, represent the subdomain storage.example.com as com.example.storage. An example using the correct format is also displayed below the input field for reference. For more information about IQNs, see 3.2.6. iSCSI Names in RFC 3720 - Internet Small Computer Systems Interface (iSCSI), available from http://tools.ietf.org/html/rfc3720#section-3.2.6 and 1. iSCSI Names and Addresses in RFC 3721 - Internet Small Computer Systems Interface (iSCSI) Naming and Discovery, available from http://tools.ietf.org/html/rfc3721#section-1. Specify the type of authentication to use for iSCSI discovery using the Discovery Authentication Type drop-down menu. Depending on which type of authentication you selected, additional input fields (such as CHAP Username and CHAP Password may then become visible. Fill in your authentication credentials; these should be provided by your organization. Click the Start Discovery button. The installer will now attempt to discover an iSCSI target based on the information you provided, and if the target requires CHAP or reverse CHAP authentication, it will attempt to use the credentials you provided. This process may take some time (generally less than 30 seconds), depending on your network. If the discovery was not successful, an error message will be displayed in the dialog window. This message will vary based on which part of the discovery failed. If the installer did not find the target you specified at all, you should check the IP address; if the problem is an authentication error, make sure you entered all CHAP and reverse CHAP credentials correctly and that you have access to the iSCSI target. The No nodes discovered error message may also mean that all nodes on the address you specified are already configured. During discovery, Anaconda ignores nodes which have already been added. If the discovery was successful, you will see a list of all discovered nodes. Select one or more nodes you want to log in to by marking or unmarking the check box next to each node discovered on the target. Below the list, select again the type of authentication you want to use; you can also select the Use the credentials from discovery option if the CHAP/reverse CHAP user name and password you used to discover the target are also valid for logging in to it. After selecting all nodes you want to use, click Log In to initiate an iSCSI session. Anaconda will attempt to log in to all selected nodes. If the login process is succesful, the Add iSCSI Storage Target dialog will close, and all nodes you have configured will now be shown in the list of network disks in Installing_Using_Anaconda.adoc#sect-installation-gui-installation-destination. You can repeat this procedure to discover additional iSCSI targets, or to add more nodes from a previously configured target. However, note that once you click the Start Discovery button for the first time, you will not be able to change the iSCSI Initiator Name. If you made an error when configuring the initiator name, you must restart the installation. Click the Add FCoE SAN button in the bottom right corner of Installing_Using_Anaconda.adoc#sect-installation-gui-installation-destination. A new dialog window will open. Select the network interface (NIC) which is connected to your FCoE switch from the drop-down menu. Note that this network interface must be configured and connected - see Installing_Using_Anaconda.adoc#sect-installation-gui-network-configuration. Data Center Bridging (DCB) is a set of enhancements to the Ethernet protocols designed to increase the efficiency of Ethernet connections in storage networks and clusters. This option should only be enabled for network interfaces that require a host-based DCBX client. Configurations on interfaces that implement a hardware DCBX client should leave this check box empty. This option indicates whether VLAN discovery should be performed. If this box is checked, then the FCoE Initiation Protocol (FIP) VLAN discovery protocol will run on the Ethernet interface once the link configuration has been validated. If they are not already configured, network interfaces for any discovered FCoE VLANs will be automatically created and FCoE instances will be created on the VLAN interfaces. This option is enabled by default. After you select which interface and options to use, click Add FCoE Disk(s). Discovered FCoE storage devices will be displayed under the Other SAN Devices tab in Installing_Using_Anaconda.adoc#sect-installation-gui-installation-destination. The Manual Partitioning screen allows you to create a storage configuration for your Fedora system manually, giving you a greater control over your system’s storage. In most other installers for both Linux and other operating systems, disk partitioning usually takes a "bottom-up" approach. In these installers, you first create underlying devices such as LVM physical volumes, then you create a layout such as LVM on top of them, then you create file systems on top of logical volumes, and the last step is usually assigning a mount point to each volume as needed. Anaconda uses an opposite approach. First, you create all separate mount points you need, and everything needed to create them (creating a volume group, logical volumes inside it, and physical volumes where the volume group will reside) is performed automatically. You can then adjust the automatic settings as you require. No permanent changes will be made to your disks during the actual partitioning process. The configuration you have selected will only be written to your system after you press the Begin installation button in Installing_Using_Anaconda.adoc#sect-installation-gui-installation-summary. When you first open the Manual Partitioning screen, the column on the left side will display all previously existing partitions on all drives which you selected as installation targers in Installing_Using_Anaconda.adoc#sect-installation-gui-storage-partitioning. If none of the selected drives contain any existing partitions, then a message informing you that no mount points currently exist will appear. Here, you can choose a partitioning scheme such as LVM or BTRFS and click the Click here to create them automatically to prompt the installer to create a basic partitioning layout; this layout follows the guidelines described in Installing_Using_Anaconda.adoc#sect-installation-gui-manual-partitioning-recommended. The created layout is a basic layout where partition/volume sizes are determined automatically based on the total amount of available space. Click the + button to add a mount point. In the dialog window that opens, choose a mount point such as / or /home, and the desired capacity for the mount point (such as 10GB or 500MB). Note that specifying the mount point is mandatory, but you do not have to specify the capacity at this point; this is useful when adding a mount point which you want to make larger than the current available space permits. Then, click Add mount point to add it to the list using the default settings, which means it will be created as a logical volume, and a new volume group will be created for it unless one already exists. Then, select the newly created mount point in the list on the left side. A set of controls will display on the right side of the screen, allowing you to change its mount point, the device on which it will physically reside, its capacity, file system, etc. When you change any settings, press Update Settings on the bottom right. This will save the adjusted configuration; you can now create another mount point, or select a different existing one and adjust its settings as well. For a description of available device and file system types, see Installing_Using_Anaconda.adoc#sect-installation-gui-manual-partitioning-filesystems. To remove a mount point, select it in the list and press the - button below. The exact steps for configuring your storage depend on your specific needs and your system configuration. Procedures for creating specific layouts are described further in this chapter. Before you start, you should also review Installing_Using_Anaconda.adoc#sect-installation-gui-manual-partitioning-recommended and Installing_Using_Anaconda.adoc#sect-installation-gui-manual-partitioning-advice for a list of requirements and tips for partitioning your disks for Fedora. Below the list of existing mount points are two fields, showing you how much free space is left on your storage devices and how much total space they have. Click the X storage devices selected to view a summary of currently selected storage devices; this may help you with orientation in more complicated storage schemas. Devices displayed here are the ones you have selected in Installing_Using_Anaconda.adoc#sect-installation-gui-storage-partitioning. If you want to add or remove any storage devices from your configuration, return to that screen and change your selection. You can press the Reset All button in the bottom right corner at any time to reset the storage configuration to the state it was in when you last opened the Manual Partitioning screen. This means that if you modify the storage configuration, leave the screen, and then come back, the Reset button will reset the configuration back to the already modified state, discarding only the changes you have made recently, not all changes to the storage configuration since you booted the installer. To discard all changes, and to also detect any new drives which have not been detected when the installer started (usually when you attached a new drive after you started), press the button marked by a circular arrow in the set of controls below the list of mount points on the left side of the screen. In the dialog window that opens, press Rescan Disks and wait until the scanning process completes. Then, press OK to return to Installing_Using_Anaconda.adoc#sect-installation-gui-storage-partitioning; all detected disks including any new ones will be displayed in the Local Standard Disks section. After you finish configuring your system storage, press Done in the top left corner to save the configuration and return to the Installation Summary screen. At this point, the installer will check if your storage configuration is valid. If an error was detected, a message will be displayed at the bottom of the screen. Click the message to open a dialog window explaining what kind of error has been detected (for example, you put /boot on a Btrfs subvolume, or you did not create a BIOS Boot partition when your system requires one). If such a message is displayed, go back and fix any issues found by the installer; otherwise you will not be able to proceed with the installation. You can also press Done again to return to the Installation Summary anyway, but a storage configuration error will prevent you from starting the actual installation process. If no error message is displayed and if you made any changes since the last time you have visited this screen, a summary dialog will appear, displaying a detailed list of the changes you made. Review the list and click Accept Changes to proceed with Installing_Using_Anaconda.adoc#sect-installation-gui-installation-summary, or click Cancel & Return to Custom Partitioning if you want to make any more changes. Standard partitions are the most common type of partition, with the widest support across operating systems. For example, Microsoft Windows uses exclusively physical partitions and can not natively work with LVM or Btrfs. Most Fedora partitioning setups will also require at least one standard partition for the /boot directory, and possibly also another standard partition with the BIOS Boot or EFI System file system to store the boot loader. See ../appendixes/Disk_Partitions.adoc#appe-disk-partitions-overview for additional information about the concepts behind physical partitions. Click the + button at the bottom of the list showing existing mount points. A new dialog window will open. In the new dialog window, specify a mount point for which you want to create a separate mount point - for example, /. Optionally, specify a size for the partition using standard units such as MB or GB (for example, 50GB). Then, click Add mount point to add the mount point and return to the main partitioning screen. When creating a swap partition, specify the mount point as swap. For a BIOS Boot partition, use biosboot. For an EFI System Partition, use /boot/efi. For information about these partition types, see Installing_Using_Anaconda.adoc#sect-installation-gui-manual-partitioning-recommended. The mount point has now been created using the default settings, which means it has been created as an LVM logical volume. Select the newly created mount point in the left pane to configure it further, and convert it to a physical partition by changing the Device Type option to Standard Partition. Then, click Update Settings in the bottom right corner of the screen. In the Device(s) section on the right side of the screen, you can see that the partition has been assigned to one or more hard drives. Click the Modify button to configure on which drive this partition will be created. In the Configure Mount Point dialog, you can specify which physical devices (disks) this volume may reside on. You can select one or more disks which will be used to hold this volume by holding down Ctrl and clicking each disk in the list. If you select multiple disks here, Anaconda will determine where exactly the partition should be created based on how you configured the rest of the installation. If you want to make sure that this partition is placed on a specific hard drive, select only that drive and unselect all others. After you finish configuring the partition’s location, click Save to return to the main Manual Partitioning screen. 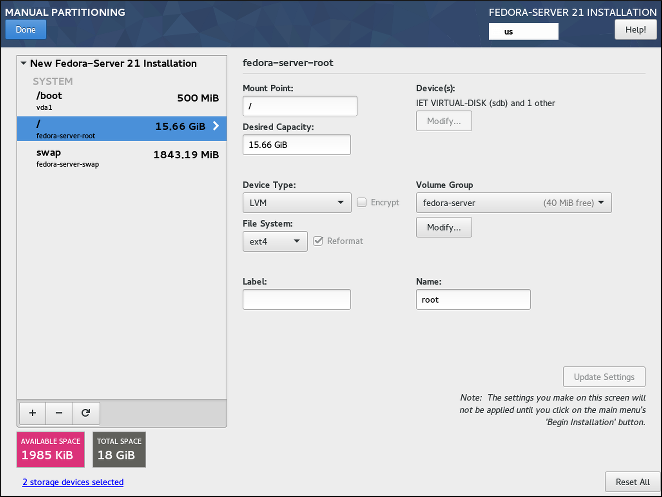 Configure other settings specific to the partition - its Mount Point, Desired Capacity, and File System. Press Update Settings to apply any changes to the configuration. Repeat this procedure for any additional standard partitions you want to create. Redundant arrays of independent disks (RAIDs) are constructed from multiple storage devices that are arranged to provide increased performance and, in some configurations, greater fault tolerance. See Installing_Using_Anaconda.adoc#sect-installation-gui-manual-partitioning-filesystems a description of different kinds of RAIDs. A RAID device is created in one step, and disks are added or removed as necessary. One RAID partition per physical disk is allowed for each device, so the number of disks available to the installation program determines which levels of RAID device are available to you. For example, if your system has two hard drives, the installation program will not allow you to create a RAID10 device, which requires 4 separate partitions. This section only explains how to create software RAID with standard (physical) partitions. However, you can also configure LVM volume groups and Btrfs volumes to use RAID and place their logical volumes or Btrfs subvolumes on top of this RAID array. See Installing_Using_Anaconda.adoc#sect-installation-gui-manual-partitioning-lvm and Installing_Using_Anaconda.adoc#sect-installation-gui-manual-partitioning-btrfs for instructions on creating RAID in LVM and Btrfs. RAID configuration options are only visible if you have selected two or more disks for installation. At least two disks are required to create a RAID device, and some RAID layouts will require more. Requirements for different types of RAID are described in Installing_Using_Anaconda.adoc#sect-installation-gui-manual-partitioning-filesystems. In the new dialog window, specify a mount point for which you want to create a separate software RAID partition - for example, /. Optionally, specify a size for the new partition using standard units such as MB or GB (for example, 50GB). Then, click Add mount point to add the mount point and return to the main partitioning screen. When creating a mount point for swap on software RAID, specify the mount point as swap. The mount point has now been created using the default settings, which means it has been created as an LVM logical volume. Select the newly created mount point in the left pane to configure it further, and convert it to a software RAID partition by changing the Device Type option to RAID. Choose a RAID type from the RAID Level drop-down menu. Available RAID types and their requirements are described in Installing_Using_Anaconda.adoc#sect-installation-gui-manual-partitioning-filesystems. In the Device(s) section on the right side of the screen, you can see that the partition has been assigned to several physical disks. Click the Modify button to configure on which drives this partition will be created. 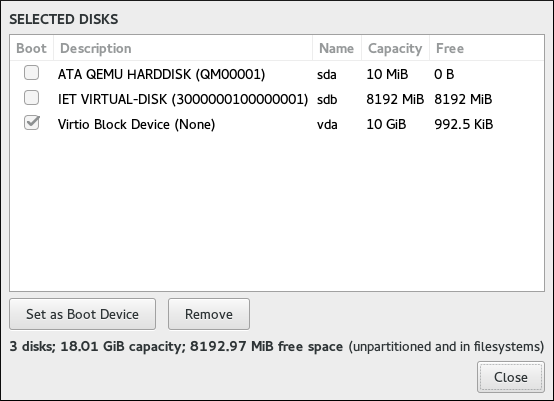 In the Configure Mount Point dialog, you can specify which physical devices (disks) this partition may reside on. You can select one or more disks which will be used to hold this partition by holding down Ctrl and clicking each disk in the list. If you want to make sure that this partition is placed on a specific set of hard drives, select only those drives and unselect all others. Repeat this procedure for any additional standard partitions with software RAID you want to create. Logical Volume Management (LVM) presents a simple logical view of underlying physical storage space, such as hard drives or LUNs. Partitions on physical storage are represented as physical volumes that can be grouped together into volume groups. Each volume group can be divided into multiple logical volumes, each of which is analogous to a standard disk partition. Therefore, LVM logical volumes function as partitions which can span multiple physical disks. See ../appendixes/Understanding_LVM.adoc#appe-lvm-overview for additional information about the concepts behind Logical Volume Management. Some partition types - notably the /boot directory and the BIOS Boot and EFI partitions - can not be placed on logical volumes. Use standard physical volumes for them. See Installing_Using_Anaconda.adoc#sect-installation-gui-manual-partitioning-recommended for more information. Follow the procedure below to create LVM logical volumes and volume groups. In the new dialog window, specify a mount point for which you want to create a separate logical volume - for example, /. Optionally, specify a size for the volume using standard units such as MB or GB (for example, 50GB). Then, click Add mount point to add the volume and return to the main partitioning screen. When creating a mount point for swap on LVM, specify the mount point as swap. The mount point has now been created using the default settings, which means it has been created as an LVM logical volume, and a volume group has been created to contain it. Select the newly created mount point in the left pane to configure it further. If you want to use thin provisioning for this volume, change the Device Type option to LVM Thin Provisioning. In the Volume Group menu, you can see that the volume has been assigned to an automatically created volume group, which is named after the Fedora variant you are installing (for example, fedora-server. Click the Modify button under the drop-down menu to access the volume group settings. In the Configure Volume Group dialog, you can change the volume group’s name, its RAID level (see Installing_Using_Anaconda.adoc#sect-installation-gui-manual-partitioning-filesystems for information about available RAID types), and you can also specify which physical devices (disks) this volume group should reside on. You can select one or more disks which will be used to hold this volume group by holding down Ctrl and clicking each disk in the list. If you select a redundant RAID type (such as RAID1 (Redundancy)), the volume group will take up twice its actual size on your disks. A 5 GB volume group with RAID1 will take up 10 GB of space. You can also make sure that the volume group is encrypted by selecting the Encrypt option; this will enable LUKS encryption for the entire volume group. See the Fedora Security Guide, available at http://docs.fedoraproject.org/, for information about LUKS disk encryption. Additionally, you can set a fixed size for the volume group by selecting the Fixed option from the Size policy menu and entering a size for the volume group. After you finish configuring the volume group settings, click Save to return to the main Manual Partitioning screen. The configuration dialog does not allow you to specify the size of the volume group’s physical extents. The size will always be set to the default value of 4 MiB. If you want to create a volume group with different physical extents, create it manually by switching to an interactive shell and using the vgcreate command, or use a Kickstart file with the volgroup --pesize=size command. If you need to create more than one volume group, open the Volume Group drop-down menu and select the Create a new volume group option. A new dialog window will open, identical to the one described in the previous step. Again, select a name, storage devices, encryption settings, RAID level and size policy for the new group, and click Save. The new volume group will then become available in the Volume Group drop-down menu; you can then go through your existing mount points and change this setting to assign them to a different volume group. Configure other settings specific to the logical volume - its Mount Point, Desired Capacity, File System, and Name. Press Update Settings to apply any changes to the configuration. Repeat this procedure for any additional logical volumes you want to create. Note that when creating additional LVM logical volumes, a new volume group is not automatically created each time; instead, any additional volumes are assigned to an existing group. For each mount point you create, review its settings and make sure that it is assigned to the correct group, that it has sufficient capacity, and that it has a descriptive name so you can identify the volume later if you need to. Btrfs is a type of file system, but it has several features characteristic of a storage device. It is designed to make the file system tolerant of errors, and to facilitate the detection and repair of errors when they occur. It uses checksums to ensure the validity of data and metadata, and maintains snapshots of the file system that can be used for backup or repair. Creating a Btrfs layout is somewhat similar to LVM (described in Installing_Using_Anaconda.adoc#sect-installation-gui-manual-partitioning-lvm) with slightly different terminology. A Btrfs volume is the equivalent of an LVM volume group, and a Btrfs subvolume is similar to a LVM logical volume. An important difference to note is how Anaconda reports sizes for separate mount points: For LVM, the exact size of each logical volume is shown next to each mount point in the left pane, while with Btrfs, the total size of the entire volume is shown next to each subvolume. Some partition types - notably the /boot and /usr directories and the BIOS Boot and EFI partitions - can not be placed on Btrfs subvolumes. Use standard physical volumes for them (or an LVM logical volume for /usr). See Installing_Using_Anaconda.adoc#sect-installation-gui-manual-partitioning-recommended for more information. When creating a mount point for swap on Btrfs, specify the mount point as swap. The mount point has now been created using the default settings, which means it has been created as an LVM logical volume. Select the newly created mount point in the left pane to configure it further, and convert it to a Btrfs subvolume by changing the Device Type option to Btrfs. Then, click Update Settings in the bottom right corner of the screen. In the Volume menu, you can see that the subvolume has been assigned to an automatically created volume, which is named after the Fedora variant you are installing (for example, fedora-server00. Click the Modify button under the drop-down menu to access the volume settings. In the Configure Volume dialog, you can change the volume’s name, its RAID level (see Installing_Using_Anaconda.adoc#sect-installation-gui-manual-partitioning-filesystems for information about available RAID types), and you can also specify which physical devices (disks) this volume should reside on. You can select one or more disks which will be used to hold this volume by holding down Ctrl and clicking each disk in the list. If you select a redundant RAID type (such as RAID1 (Redundancy)), the volume will take up twice its actual size on your disks. A 5 GB volume with RAID1 will take up 10 GB of space. You can also make sure that the volume is encrypted by selecting the Encrypt option; this will enable LUKS encryption for the entire volume. See the Fedora Security Guide, available at http://docs.fedoraproject.org/, for information about LUKS disk encryption. Additionally, you can set a fixed size for the volume by selecting the Fixed option from the Size policy menu and entering a size for the volume group. After you finish configuring the Btrfs volume settings, click Save to return to the main Manual Partitioning screen. If you need to create more than one Btrfs volume, open the Volume drop-down menu and select the Create a new volume group option. A new dialog window will open, identical to the one described in the previous step. Again, select a name, storage devices, encryption settings, RAID level and size policy for the new volume, and click Save. The new volume will then become available in the Volume Group drop-down menu; you can then go through your existing mount points and change this setting to assign them to a different volume. Configure other settings specific to the subvolume - its Mount Point, Desired Capacity, File System, and Name. Press Update Settings to apply any changes to the configuration. Repeat this procedure for any additional Btrfs subvolumes you want to create. Note that when creating additional subvolumes, a new volume is not automatically created each time; instead, any additional subvolumes are assigned to an existing volume. For each mount point you create, review its settings and make sure that it is assigned to the correct volume, that it has sufficient capacity, and that it has a descriptive name so you can identify the subvolume later if you need to. Fedora supports multiple types of devices and file systems. The lists below offer a short description of each available device, file system and RAID type and notes on their usage. To select a device type or a file system of a partition or a logical volume, select it in the list in Installing_Using_Anaconda.adoc#sect-installation-gui-manual-partitioning and select a Device Type and a File System from their respective drop-down menus on the right side of the screen. Then, click Update Settings and repeat this process for all mount points you want to modify. To configure software RAID, make sure that you have enough physical hard drives selected as installation targets (the number of separate drives required for each type of RAID is noted in its description). Then, choose a RAID level when creating or modifying a Btrfs volume or LVM volume group, or select Software RAID as the device type to create software RAID with standard partitions. For detailed instructions, see Installing_Using_Anaconda.adoc#sect-installation-gui-manual-partitioning-btrfs, Installing_Using_Anaconda.adoc#sect-installation-gui-manual-partitioning-lvm, and Installing_Using_Anaconda.adoc#sect-installation-gui-manual-partitioning-swraid as needed. Standard Partition - A standard partition can contain a file system or swap space. Standard partitions are most commonly used for /boot and the BIOS Boot and EFI System partitions. LVM logical volumes or Btrfs subvolumes are recommended for most other uses. See ../appendixes/Disk_Partitions.adoc#appe-disk-partitions-overview for additional information about the concepts behind physical partitions. LVM - Choosing LVM as the Device Type creates an LVM logical volume and a volume group to contain it (unless one already exists, in which case the new volume is assigned to the existing group). LVM can improve performance when using physical disks and allows you to use multiple disks for a single mount point. For information on how to create a logical volume, see Installing_Using_Anaconda.adoc#sect-installation-gui-manual-partitioning-lvm. Also see ../appendixes/Understanding_LVM.adoc#appe-lvm-overview for some additional information about LVM in general. LVM Thin Provisioning - Using thin provisioning, you can manage a storage pool of free space, known as a thin pool, which can be allocated to an arbitrary number of devices when needed by applications. The thin pool can be expanded dynamically when needed for cost-effective allocation of storage space. RAID - Creating two or more software RAID partitions allows you to create a software RAID device. One RAID partition is assigned to each disk on the system. See Installing_Using_Anaconda.adoc#sect-installation-gui-manual-partitioning-swraid for instructions on creating software RAID. BTRFS - Btrfs is a file system with several device-like features. It is capable of addressing and managing more files, larger files, and larger volumes than the ext2, ext3, and ext4 file systems. See Installing_Using_Anaconda.adoc#sect-installation-gui-manual-partitioning-btrfs for more information about creating Btrfs volumes. ext4 - The ext4 file system is based on the ext3 file system and features a number of improvements. These include support for larger file systems and larger files, faster and more efficient allocation of disk space, no limit on the number of subdirectories within a directory, faster file system checking, and more robust journaling. Ext4 is the default and recommended file system used by Fedora Workstation and Cloud. The maximum supported size of a single ext4 file system is 50 TB. ext3 - The ext3 file system is based on the ext2 file system and has one main advantage - journaling. Using a journaling file system reduces time spent recovering a file system after a crash, as there is no need to check the file system for metadata consistency by running the fsck utility every time a crash occurs. swap - Swap partitions are used to support virtual memory. In other words, data is written to a swap partition when there is not enough RAM to store the data your system is processing. A swap partition should always be created; see Installing_Using_Anaconda.adoc#sect-installation-gui-manual-partitioning-recommended for details such as the recommended size. xfs - XFS is a highly scalable, high-performance file system that supports file systems up to 16 exabytes (approximately 16 million terabytes), files up to 8 exabytes (approximately 8 million terabytes), and directory structures containing tens of millions of entries. XFS also supports metadata journaling, which facilitates quicker crash recovery. The maximum supported size of a single XFS file system is 500 TB. Starting with Fedora 22, XFS is the default and recommended file system on Fedora Server. Note that the size of an XFS file system can not currently be reduced without destroying and recreating the file system. If you expect that you will need to adjust the sizes of your file systems often, using XFS is not recommended, as it makes administration substantially more time-consuming. BIOS Boot - A very small partition required for booting from a device with a GUID partition table (GPT) on BIOS systems and UEFI systems in BIOS compatibility mode. See Installing_Using_Anaconda.adoc#sect-installation-gui-manual-partitioning-recommended for details. EFI System Partition - A small partition required for booting a device with a GUID partition table (GPT) on a UEFI system. See Installing_Using_Anaconda.adoc#sect-installation-gui-manual-partitioning-recommended for details. RAID0 (Performance) - Distributes data across multiple disks. Level 0 RAID offers increased performance over standard partitions and can be used to pool the storage of multiple disks into one large virtual device. Note that Level 0 RAIDs offer no redundancy and that the failure of one device in the array destroys data in the entire array. RAID 0 requires at least two disks. RAID1 (Redundancy) - Mirrors all data from one partition onto one or more other disks. Additional devices in the array provide increasing levels of redundancy. RAID 1 requires at least two disks. RAID4 (Error Checking) - Distributes data across multiple disks and uses one disk in the array to store parity information which safeguards the array in case any disk within the array fails. Because all parity information is stored on one disk, access to this disk creates a "bottleneck" in the array’s performance. Level 4 RAID requires at least three disks. RAID5 (Distributed Error Checking) - Distributes data and parity information across multiple disks. Level 5 RAIDs therefore offer the performance advantages of distributing data across multiple disks, but do not share the performance bottleneck of level 4 RAIDs because the parity information is also distributed through the array. RAID 5 requires at least three disks. RAID6 (Redundant Error Checking) - Level 6 RAIDs are similar to level 5 RAIDs, but instead of storing only one set of parity data, they store two sets. RAID 6 requires at least four disks. RAID10 (Performance, Redundancy) - Level 10 RAIDs are nested RAIDs or hybrid RAIDs. They are constructed by distributing data over mirrored sets of disks. For example, a level 10 RAID array constructed from four RAID partitions consists of two mirrored pairs of striped partitions. RAID 10 requires at least four disks. This partition contains the operating system kernel, which allows Fedora to boot. It also contains other files used during the bootstrap process. Due to the limitations of most firmware, creating a separate, small standard partition for this directory is recommended. In most scenarios, a 500 MB /boot partition is adequate. If your system has a hardware RAID controller, be aware that some BIOS types do not support booting from it. In that case, the /boot partition must be created on a partition outside of the RAID array, such as on a separate hard drive. Also note that the /boot directory can not be placed on a LVM logical volume or a Btrfs subvolume. Use a standard partition. This is where the root directory is located. The root directory is the top level of the directory structure. By default, all files are written to this partition unless a different partition is mounted in the path being written to (for example, /boot or /home). If you follow the recommended scheme described in this section, this will be the partition where most software packages will be installed. For a minimal installation, a 5 GB root partition will be sufficient. However, for most common installations which include extra packages and a graphical user interface, the root partition should be at least 10 GB; with 20 GB being sufficient for most common use cases. The / mount point is the top of the Linux Filesystem Hierarchy, and is referred to as the root file system, or root. The /root directory, sometimes pronounced "slash-root", is the home directory for the root user. To store user data separately from system data, create a dedicated mount point for the /home directory. This partition should be sized based on the amount of data that will be stored locally, number of users, and so on. This will allow you to upgrade or reinstall Fedora without erasing user data files. During the installation, a separate /home partition will be created if there are 50 GB or more free space for your Fedora installation. When using Fedora as a workstation for normal use with a graphical environment, this mount point should have the most disk space assigned to it, as it will likely hold the most data (user settings, images, videos, etc). Swap partitions support virtual memory; data is written to them when there is not enough RAM to store the data your system is processing. This partition’s size is a function of system memory workload, not total system memory, and therefore is not equal to the total system memory size. Therefore, it is important to analyze what applications a system will be running and the load those applications will serve in order to determine the system memory workload. Application providers and developers should be able to provide some guidance. When the system runs out of swap space, the kernel terminates processes as the system RAM memory is exhausted. Configuring too much swap space results in storage devices being allocated but idle and is a poor use of resources. Too much swap space can also hide memory leaks. The maximum size for a swap partition and other additional information can be found in the mkswap(8) man page. The table below provides the recommended size of a swap partition depending on the amount of RAM in your system and whether you want sufficient memory for your system to hibernate. If you let the installation program partition your system automatically, the swap partition size will be established using these guidelines. Automatic partitioning setup assumes hibernation is not in use, and the maximum size of the swap partition is limited to 10% of the total size of the hard drive. If you want to set up enough swap space to allow for hibernation, or if you want to set the swap partition size to more than 10% of the system’s storage space, you must edit the partitioning layout manually. At the border between each range listed above (for example, a system with 2 GB, 8 GB, or 64 GB of system RAM), discretion can be exercised with regard to chosen swap space and hibernation support. If your system resources allow for it, increasing the swap space may lead to better performance. You can force the installer to use GPT on disks smaller than 2 TB by using the inst.gpt boot option as described in ../advanced/Boot_Options.adoc#chap-anaconda-boot-options. However, the opposite is not possible - you can not use MBR on disks larger than 2 TB. You need to create a BIOS Boot partition with a size of 1 MB to install on a system with BIOS firmware if the disk containing the boot loader uses GPT. If the disk uses a MBR, no special partition is necessary on a BIOS system. Only GPT is allowed on UEFI systems. In order to install on a formatted disk with a MBR, it must be reformated and relabeled. All data currently on the disk will be lost. UEFI-based systems require an EFI System Partition at least 50 MB in size (recommended size is 200 MB), regardless of the partitioning scheme. If your system requires either a BIOS Boot partition or an EFI System Partition based on the requirements detailed above, this partition must be created as a standard physical partition. It can not reside on an LVM volume or a Btrfs subvolume. Also note that if your system does not require any of these partitions, they will not be shown in the File System menu in mount point options. Many systems have more partitions than the minimum listed above. Choose partitions based on your particular needs. See Installing_Using_Anaconda.adoc#sect-installation-gui-manual-partitioning-advice for additional information and advice. Only assign storage capacity to those partitions you require immediately. You may allocate free space at any time, to meet needs as they occur. If you are not sure how best to configure the partitions for your computer, accept the automatic default partition layout provided by the installation program as described in Installing_Using_Anaconda.adoc#sect-installation-gui-storage-partitioning. Consider encrypting any partitions and volumes which might contain sensitive data. Encryption prevents unauthorized people from accessing the data on the partitions, even if they have access to the physical storage device. In most cases, you should at least encrypt the /home partition, which contains user data. In some cases, creating separate mount points for directories other than /, /boot and /home may be useful; for example, on a server running a MySQL database, having a separate mount point for /var/lib/mysql will allow you to preserve the database during a reinstallation without having to restore it from backup afterwards. However, having unnecessary separate mount points will make storage administration more difficult. Some special restrictions apply to certain directories with regards on which partitioning layouts can they be placed. Notably, the /boot directory must always be on a physical partition (not on an LVM volume or a Btrfs subvolume), and /usr can not be on a Btrfs subvolume. If you are new to Linux, consider reviewing the Linux Filesystem Hierarchy Standard at http://refspecs.linuxfoundation.org/FHS_2.3/fhs-2.3.html for information about various system directories and their contents. Each kernel installed on your system requires approximately 20 MB on the /boot partition. The default partition size of 500 MB for /boot should suffice for most common uses; increase the size of this partition if you plan to keep many kernels installed at the same time. The /var directory holds content for a number of applications, including the Apache web server, and is used by the DNF package manager to temporarily store downloaded package updates. Make sure that the partition or volume containing /var has at least 3 GB. The contents of the /var directory usually change very often. This may cause problems with older solid state drives (SSDs), as they can handle a lower number of read/write cycles before becoming unusable. If your system root is on an SSD, consider creating a separate mount point for /var on a classic (platter) HDD. The /usr directory holds the majority of software on a typical Fedora installation. The partition or volume containing this directory should therefore be at least 5 GB for minimal installations, and at least 10 GB for installations with a graphical environment. If /usr or /var is partitioned separately from the rest of the root volume, the boot process becomes much more complex because these directories contain boot-critical components. In some situations, such as when these directories are placed on an iSCSI drive or an FCoE location, the system may either be unable to boot, or it may hang with a Device is busy error when powering off or rebooting. Consider leaving a portion of the space in an LVM volume group unallocated. This unallocated space gives you flexibility if your space requirements change but you do not wish to remove data from other volumes. You can also select the Thin provisioning device type for the partition to have the unused space handled automatically by the volume. The size of an XFS file system can not be reduced - if you need to make a partition or volume with this file system smaller, you must back up your data, destroy the file system, and create a new, smaller one in its place. Therefore, if you expect needing to manipulate your partitioning layout later, you should use the ext4 file system instead. Use Logical Volume Management (LVM) if you anticipate expanding your storage by adding more hard drives after the installation. With LVM, you can create physical volumes on the new drives, and then assign them to any volume group and logical volume as you see fit - for example, you can easily expand your system’s /home (or any other directory residing on a logical volume). Creating a BIOS Boot partition or an EFI System Partition may be necessary, depending on your system’s firmware, boot drive size, and boot drive disk label. See Installing_Using_Anaconda.adoc#sect-installation-gui-manual-partitioning-recommended for information about these partitions. Note that the graphical installer will not let you create a BIOS Boot or EFI System Partition if your system does not require one - in that case, they will be hidden from the menu. If you need to make any changes to your storage configuration after the installation, Fedora repositories offer several different tools which can help you do this. If you prefer a command line tool, try system-storage-manager. This screen is disabled by default. To enable it during the installation, you must use the inst.kdump_addon=on option at the boot menu. See ../advanced/Boot_Options.adoc#sect-boot-options-advanced for details, and Booting_the_Installation.adoc#sect-boot-menu for instructions on using custom boot options. Use this screen to select whether or not Kdump will be activated on the installed system, and how much memory will be reserved for it if enabled. Kdump is a kernel crash dumping mechanism which, in the event of a system crash, captures the contents of the system memory at the moment of failure. This captured memory can then be analyzed to find the cause of the crash. If Kdump is enabled, it must have a small portion of the system’s memory (RAM) reserved to itself. This reserved memory will not be accessible to the main kernel. To enable Kdump on the installed system, check Enabled. Then, select either Automatic or Manual memory reservation settings, and if you selected Manual, enter the amount of memory to be reserved in megabytes into the Memory to be reserved field. The amount of memory which you should reserve is determined based on your system’s architecture (AMD64 and Intel 64 will have different requirements than IBM Power, for example) as well as the total amount of system memory. In most cases, automatic reservation will be satisfactory. If you insist on manual settings, see the Red Hat Enterprise Linux 7 Kernel Crash Dump Guide for guidelines. This document also contains more in-depth information about how Kdump works, how to configure additional settings, and how to analyze a saved crash dump. The Usable System Memory readout below the reservation input field shows how much memory will be accessible to your main system once your selected amount of RAM is reserved. Additional settings, such as the location where kernel crash dumps will be saved, can only be configured after the installation using either the system-config-kdump graphical interface, or manually in the /etc/kdump.conf configuration file. After configuring Kdump settings, click Done in the top left corner to return to Installing_Using_Anaconda.adoc#sect-installation-gui-installation-summary. The Network & Hostname screen is used to configure network interfaces. Options selected here will be available both during the installation (if needed for tasks such as downloading packages from a remote location) and on the installed system. Network configuration is an expansive topic and many of the options available during the installation are beyond the scope of this document. For detailed information about networking, including both theoretical topics and specific instructions and examples, see the Fedora Networking Guide, available at http://docs.fedoraproject.org/. Locally accessible interfaces are automatically detected by the installation program and cannot be manually added or deleted. All detected interfaces are listed on the left side of the screen. 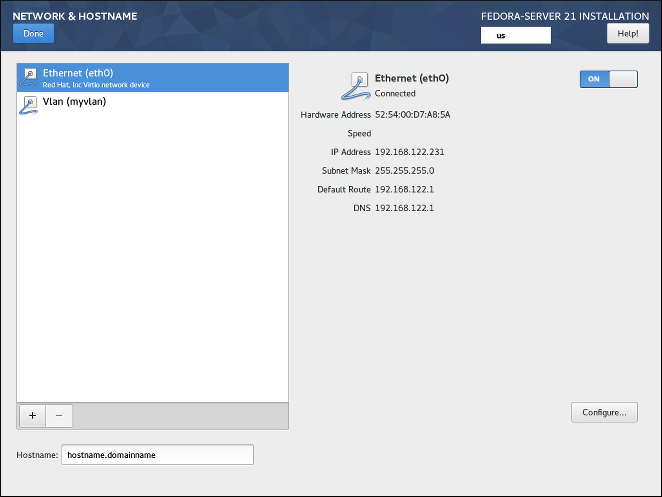 Click an interface in the list to display its current configuration (such as IP and DNS address); the details are displayed on the right side of the screen. Below the list of interfaces are two buttons. Use the + button to add a virtual network interface (Team, Bond or VLAN) as described in Installing_Using_Anaconda.adoc#sect-installation-gui-network-configuration-virtual-interface. To remove a previously created virtual interface, select it in the list and click the - button. To change settings such as IP addresses, DNS servers, or routing configuration for an existing interface (both virtual and physical), select the interface in the left pane and click Configure in the bottom right corner of the screen. Available settings are described in Installing_Using_Anaconda.adoc#sect-installation-gui-network-configuration-advanced. Use the ON/OFF switch in the top right corner to enable or disable the currently selected interface. Below the list of connections, enter a host name for this computer in the Hostname input field. The host name can be either a fully-qualified domain name (FQDN) in the format hostname.domainname, or a short host name with no domain name. Many networks have a Dynamic Host Configuration Protocol (DHCP) service that automatically supplies connected systems with a domain name; to allow the DHCP service to assign the domain name to this machine, only specify the short host name. Bond - NIC (Network Interface Controller) Bonding, a method to bind multiple physical network interfaces together into a single bonded channel. Team - NIC Teaming, a new implementation to aggregate links, designed to provide a small kernel driver to implement the fast handling of packet flows, and various applications to do everything else in user space. Vlan (Virtual LAN) - A method to create multiple distinct broadcast domains which are mutually isolated. Select the interface type you want to add, and click Add. Another dialog window will open, allowing you to edit any available settings for your chosen interface type. For information about available settings, see the respective sections of the Fedora Networking Guide, available at http://docs.fedoraproject.org/. Basic documentation is also available in Installing_Using_Anaconda.adoc#sect-installation-gui-network-configuration-advanced. To access the settings dialog again after you closed it, select the same interface in the list of configured interfaces and click Configure in the bottom right corner of the screen. To remove a virtual interface, select it in the list and click the - button below. This section only details the most important settings for a typical wired connection used during installation. Many of the available options do not have to be changed in most installation scenarios and are not carried over to the installed system. Configuration of other types of networks is broadly similar, although the specific configuration parameters may be different. To learn more about network configuration after installation, see the Fedora Networking Guide, available at http://docs.fedoraproject.org/. To configure a network connection manually, select that connection in the list on the left side of the screen, and click the Configure button. A dialog will appear that allows you to configure the selected connection. The configuration options presented depends on the connection type - the available options will be slightly different depending on whether it is a physical interface (wired or wireless network interface controller) or a virtual interface (Bond, Team or Vlan) which you previously configured in Installing_Using_Anaconda.adoc#sect-installation-gui-network-configuration-virtual-interface.. A full description of all configuration settings for all connection types is beyond the scope of this document; see the Networking Guide for details. In the General tab of the configuration dialog, you can select or unselect the Automatically connect to this network when it is available check box to allow or disallow this connection to connect by default. When enabled on a wired connection, this means the system will typically connect during startup (unless you unplug the network cable); on a wireless connection, it means that the interface will attempt to connect to any known wireless networks in range. Additionally, you can allow or disallow all users on the system from connecting to this network using the All users may connect to this network option. If you disable this option, only root will be able to connect to this network. It is not possible to only allow a specific user other than root to use this interface, because no other users are created at this point during the installation. If you need a connection for a different user, you must configure it after the installation. By default, both IPv4 and IPv6 are set to automatic configuration depending on current network settings. This means that addresses such as the local IP address, DNS address, and other settings will be detected automatically each time the interface connects to a network. In many cases, this is sufficient, but you can also provide static configuration in the IPv4 Settings and IPv6 Settings, respectively. To set static network configuration, navigate to one of the settings tabs and select a method other than Automatic (for example, Manual) from the Method drop-down menu. This will enable the Addresses field below. In the IPv6 Settings tab, you can also set the method to Ignore to disable IPv6 on this interface. Then, click Add on the right side and add a set of settings: Address, Netmask (for IPv4), Prefix (for IPv6), and Gateway. The DNS servers field accepts one or more IP addresses of DNS servers - for example, 10.0.0.1,10.0.0.8. The final option in both tabs is Require IPvX addressing for this connection to complete. Select this option in the IPv4 tab to only allow this connection if IPv4 was successful; the same principle applies to this setting in the IPv6 tab. If this option remains disabled for both IPv4 and IPv6, the interface will be able to connect if configuration succeeds on either IP protocol. In the IPv4 Settings and IPv4 Settings tabs, click the Routes button in the bottom right corner to configure routing settings for a specific IP protocol on an interface. A new dialog will open, allowing you to Add a specific route. If you confire at least one static route, you can disallow all routes not specifically configured here by enabling the Ignore automatically obtained routes. Select Use this connection only for resources on its network to prevent this connection from becoming the default route. This option can be selected even if you did not configure any static routes. Enabling this option means that this route will only be used when necessary to access certain resources, such as intranet pages which require a local or VPN connection. Another (default) route will be used for publicly available resources if possible. Note that unlike the additional routes configured in this dialog, this setting will be transferred to the installed system. Also note that this option is only useful when more than one interface is configured. When you finish configuring the interface’s routing settings, click OK to return to the configuration dialog. Once you finish configuring the interface, click Save in the configuration window’s bottom right corner to save your settings and return to Installing_Using_Anaconda.adoc#sect-installation-gui-network-configuration. The Configuration screen is displayed after you finish configuring all required items in Installing_Using_Anaconda.adoc#sect-installation-gui-installation-summary and press the Begin installation button. After this point, the installation process actually starts and changes are being made to your selected disks. It is not possible to go back to the Installation Summary and change any settings configured there; if you need to do so, you must wait for the installation process to finish, reboot your system, log in and change your settings on the installed system. In the top part of the screen, two additional options are available, allowing you to configure authentication settings - the root password and an additional user account. Configuring the root password is required to finish the installation; creating a user account can be skipped. If you do so, you will be prompted to create a non-root user account after the installation finishes and your system reboots. The bottom of the screen shows a progress bar and a message informing you of the current progress of the installation. When the installation finishes and the root password has been set, you can press the Finish configuration button to reboot your computer and log in to your newly installed Fedora system. Before you finish the installation and reboot, either remove the media (CD, DVD or a USB drive) which you used to start the installation, or make sure that your system tries to boot from the hard drive before trying removable media. Otherwise, your computer will start the installer again instead of the installed system. The Root Password screen is used to configure the root password for your system. This password will be used to log into the administrator (also known as superuser) account, which is used for system administration tasks such as installing and updating software packages and changing system-wide configuration such as network and firewall settings, storage options and adding or modifying users, groups and file permissions. The root account will always be created during the installation. However, you should always also create a normal user accont in Installing_Using_Anaconda.adoc#sect-installation-gui-create-user and use that account to log in to the system. Only switch to the administrator account only when you need to perform a task which requires administrator access. The root account has complete control over the system. If an unauthorized person gains access to this account, they can access or delete all users' personal files or otherwise exploit the machine for their own nefarious purposes. See the Fedora Security Guide, available at http://docs.fedoraproject.org/, for detailed documentation about account security and guidelines for choosing a strong password. Once you choose a strong password, enter it in the Root Password field. The characters you write will be displayed as dots for security. Then, type the same password into the Confirm field to ensure you entered it properly. Both entered passwords must be the same. The password you have provided is weak: The password is shorter than 5 characters. If a message similar to the above appears, it is highly recommended to choose a different, stronger password. Once you configure the superuser password, click Done in the top left corner to return to Installing_Using_Anaconda.adoc#sect-installation-gui-installation-progress. If you selected a weak password, you must press the button twice. The Create User screen can be used to create and configure one normal (non-root) user account during the installation. Only one user account can be configured here; if you require more accounts, wait until the installation completes, reboot your system and then create other accounts using either the useradd command in a terminal, or a graphical utility for managing user accounts (for example, the Users screen in the Settings menu in GNOME). Creating a normal user account is not required to finish the installation; however, it is highly recommended. If you do not create one, you will have to log in to the system as root directly, which is not recommended. To configure a user account, fill out the Full name (for example, John Smith) and Username (for example, jsmith). The username will used to log in from a command line; if you install a graphical environment, then your graphical login manager will use Full name. Make sure that the Require a password to use this account check box is enabled, enter a password you want to use for this account into the Password field. The characters you write will be displayed as dots for security. Then, repeat the same password in the Confirm password field below to ensure you entered it properly. Both entered passwords must be the same. The Make this user administrator check box gives the user you are creatng administrative rights (by adding this user into the wheel group), allowing this user to use the sudo command to perform tasks normally only available to root using only the user password, instead of the root password. This may be more convenient, but can also pose a security risk. If you give administrator privileges to an user, make sure that the account is protected by a strong password. Never give an user administrator privileges without requiring any password for the account. See the Fedora Security Guide, available at the http://docs.fedoraproject.org/, for detailed information about password security including guidelines for selecting strong passwords. To additional settings, click the Advanced button below the password input fields. A new dialog window titled Advanced User Configuration will open. This dialog is described in the following section. The Advanced User Configuration dialog allows you to change the following settings for the new user account. The user’s Home directory (/home/username by default). The user’s ID (UID). The default value is 1000. UIDs 0-999 are reserved by the system so they can not be assigned to an user. The the group ID (GID) of the user’s default group. The default group name will be the same as the user name, and its default GID is 1000. GIDs 0-999 are reserved by the system so they can not be assigned to an user’s group. The user’s group membership. The user account you are creating will always have one default group membership (the user’s default group with an ID set in the Specify a group ID manually field). In the Group Membership field, you can specify additional groups as a comma-separated list. Groups which do not already exist will be created; you can specify custom GIDs for them in parentheses. If you do not specify a custom GID for a new group, it will be assigned automatically.